Are you a hardworking individual with a desire to grow your career in a team-oriented environment? A supply chain career with UPMC could be the best place to start! 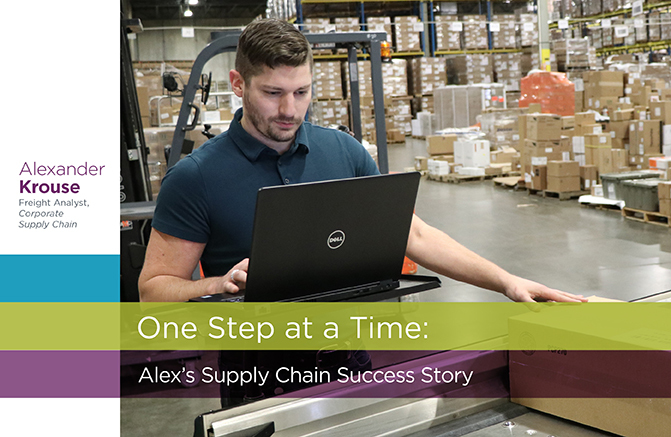 Throughout the month of March, read the stories of four individuals who found meaningful careers on the supply chain teams of UPMC, and why they’d recommend pursuing a spot with UPMC supply chain. There I was — on the verge of graduating from college and moving on to a new chapter of life. Like many 22-year-olds, I was filled with questions about what to do next. I originally intended to enter the sales or marketing fields, but I was unsure of what I wanted my career path to be to get there. What to do? Where to go? As graduation day (and adulthood) loomed, one of my coworkers at the time informed me that the UPMC warehouse in Warrendale was hiring. As I thought about it, I knew that an entry-level position with a company like UPMC could offer a lot of job opportunities down the road. Though I was still unsure about my career path, I knew UPMC would be able to provide me with the time and options I needed. I decided to apply, and the rest is history. In many ways, I am a textbook example of “starting at the entry level and working my way up.” When I started as a warehouser with UPMC, my intent at first was to work the long hours and put money away. But as the months went on and my knowledge base grew, I saw that it could be more than just a paycheck. I quickly escalated from picking, to machine operator, to a promotion to team leader within my first year. All my experience with the product and inventory section of the warehouse gave me invaluable knowledge to be successful as a team leader. Already having this knowledge made it easier to focus on the leadership aspect of the position and incorporate myself into management. Eventually my aspirations grew and I knew I wanted to do more. I was given a chance to move to the hospital level as a supervisor of inventory. Being a supervisor at a hospital was a very different experience, but it built on all my experiences at UPMC thus far. The new role gave me the opportunity to mature and allowed me to develop skills in delegating and management and a true understanding of the product and its path from beginning to end. Although there was training involved with this new role, I would learn a lesson that I’ve continued to carry with me: experience is often the best teacher. Today, I am learning and experiencing a whole new side of UPMC, though I still carry the lessons of determination, perseverance, and hard work with me from my previous roles. My current title is freight analyst. This role is much different than those I’ve held in the past in that it requires me to tap into my investigative side. My job is focused on finding the issues that need to be solved; it’s a role that requires self-motivation and an eye for the big picture. Although this role in freight does not appear as impactful as something like patient care, it does have a direct impact on UPMC’s finances, which, in the end, impacts the patients and communities we serve. As I think back on my career at UPMC so far, I want to speak directly to everyone who was in the same place I was at 22. Not knowing what comes next in your life or career is intimidating, but the important thing to remember is all it takes to move forward is one step. Just one step. Sometimes in our careers, the first, second, or even third position you obtain might not be one you want, but I am a testament to how each and every position is a step forward that will make you a better employee. If you have the patience and drive, the opportunities are truly endless. No matter what you went to school for, you can find a position in supply chain that applies. Today, I have been given the opportunity to work in a competitive, caring company with affordable benefits, keeping my family happy and healthy; nothing beats that. I still don’t know where this path in life is going to take me, but I’ll keep moving forward, one step at a time. A career with UPMC provides opportunities to achieve the goals you have for your career and your personal life. Explore a career path with supply chain and learn more about the opportunities you can pursue to get you to where you want to be.